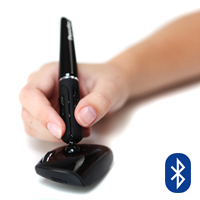 The Goldtouch Ergonomic Mouse tilts the hand by 24°, so that the thumb is higher than the little finger. This position places less strain on the muscles and joints of the arm, wrist and hand than the familiar "palm down" position. 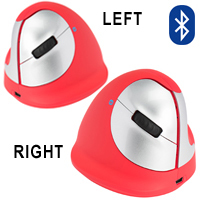 The mouse features a non-slip concave well for the thumb and oversized curved buttons in a rounded design that provides comfort and support for the whole hand. 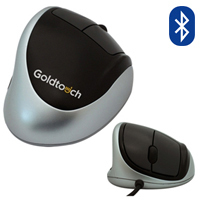 A corded version of the Goldtouch Ergonomic Mouse is available for left and right handed users; Bluetooth models (with and without Receiver Dongles) are available for right handed users only. Le Goldtouch Ergonomic Mouse offre l`inclinaison de la main par 24°, afin que le pouce soit plus haute que le petit doigt. Cette position offre moin de pression sur les muscles et jointures du bras, poignet et main que la position connu de "paume vers le bas/palm down". Les caractéristics de la souris sont une courbe concave pour le pouce caoutchouté et des boutons plus grands courbés qui fournit le confort et support de toute la main. 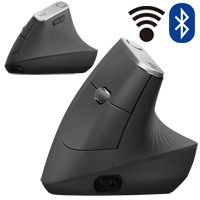 Un modèle du Goldtouch Ergonomic Mouse est disponible avec fil pour gauche et droite; le modèle Bluetooth (avec et sans la clé USB) sont seulement disponible pour la main droite. 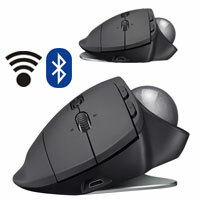 The MX Ergo Wireless Trackballs from Logitech share many design features with the M570 Wireless Trackball. The body contours are virtually identical, with more angular lines and a metallic grey trackball to distinguish it from the M570. 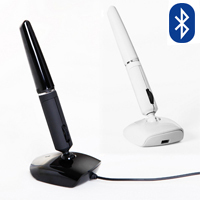 The differences focus on improved ergonomics and expanded functionality. 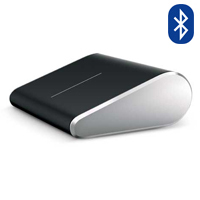 The MX Ergo Wireless Trackball features a magnetic base plate on which the trackball can be angled to either 0° or 20° by a simple shift of pressure from the hand. The MX Ergo PLUS model also ships with an extra wedge which can be attached (also magnetically) to provide a fixed 30° angle (the MX Ergo does not include this wedge). 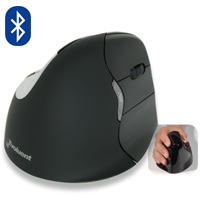 The MX Ergo Trackball transfers all cursor control to the thumb, which virtually eliminates arm movement when mousing. Accurate adjustable optical tracking is provided by a 320-440 DPI laser sensor with a thumb-activated Precision Mode button. The contoured body provides a relaxing support for the hand, naturally positioning the fingers over the right and left buttons. A rubber-coated tilting scroll wheel with crisp detents is conveniently positioned between these buttons to complete the traditional mouse control layout. The index finger has easy access to convenient Back and Forward Buttons for browsing through multiple pages of a document or web page. 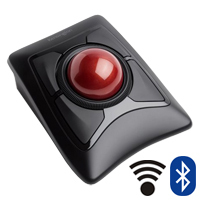 The MX Ergo Wireless Trackball offers Dual Connectivity - USB via the Logitech Unifying receiver, or Bluetooth (see Detailed Specifications for compatibility details). Users of multiple computers may wish to take advantage of the "Logitech Flow" capability to connect with and work seamlessly across two separate computers. Note: As the MX Ergo Wireless Trackballs place the workload fully upon the thumb, (which on most other trackballs is generally shared amongst several fingers), anyone who has existing thumb issues would be well-advised to consider alternative solutions.